Spelled as Kau Kee Cai or Kow Kee Chye ( 九杞菜 ), these Wolfberry Leaves have thorns that will hurt you if you are not careful enough, but the highly nutritious vegetables are known to give you good eyesight! 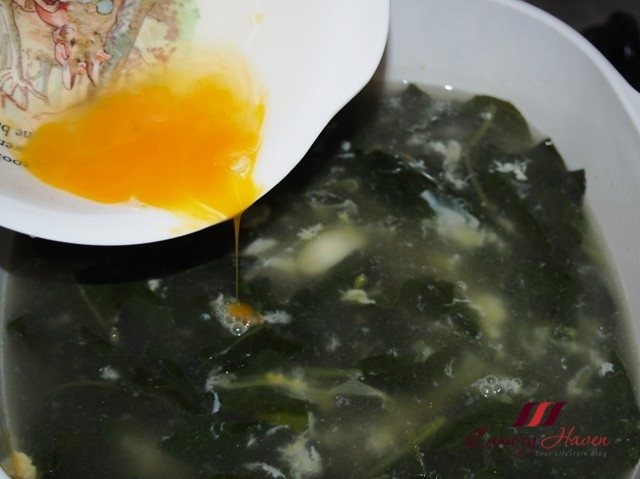 The tasty Egg-Drop Soup with a combination of Chicken Egg and Salted Duck Egg, makes this a dish worth craving for. 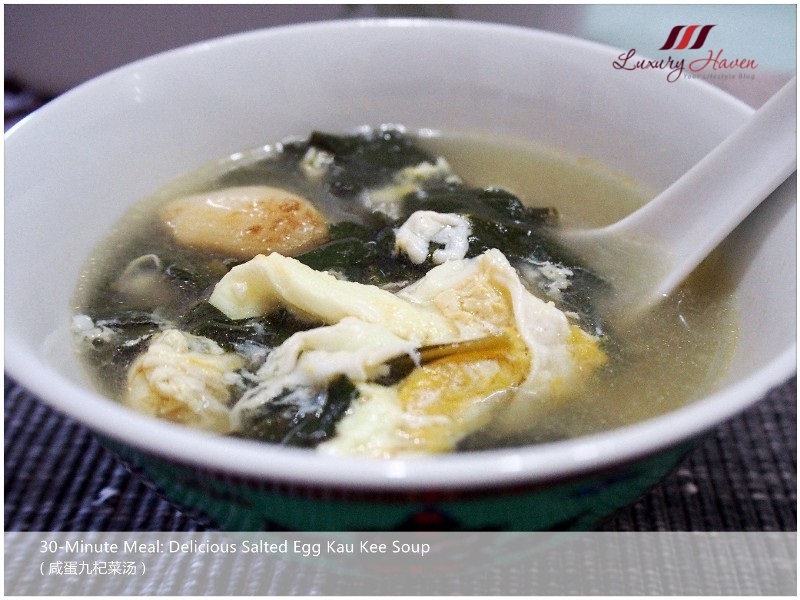 Try this easy-cooking 30-Minute Meal this weekend and fall in love with this Delicious Salted Egg Kau Kee Soup ( 咸蛋九杞菜汤 )! 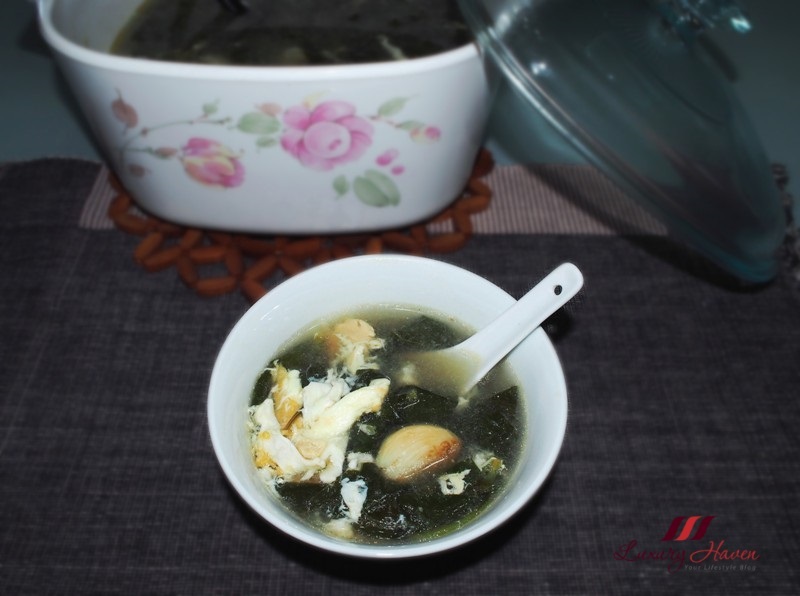 Serve your Delicious Salted Egg Kau Kee Soup ( 咸蛋九杞菜汤 ) hot! Easy enough? Do you like Kau Kee Soup too? How do you cook these wolfberry leaves? Even better than wolfberries. Must be tasty soup. Thanks for sharing. this soup seems yummy!!!! you're such a great chef. I wish I could invite myself for lunch at your place. Umm another yummy recipe. Thanks for sharing, Shirley. Yum to this my fav soup. I love it so much. I love adding greens to soup! Lovely! I love salted egg but I've never had Kau Kee Soup. Look so tasty Shirley! I love this kau kee salted egg soup. My mother used to boil it for us when we were children. Parece ser bem gostoso! Queria provar! Hi Shirley, this soup is healthy and appetizing. Plain rice with this soup is good enough for me. Looks very tasty, Shirley. Wishing you a beautiful week, girl. I love clear soups with chunks of vegetables, meat and eggs in it.This looks lovely! Salted egg - yes please! I have cooked egg dropped soup with black fungus before but I've never tried cracking a duck egg into a soup - this sound interesting and unique! I am going to try this one for sure. Looks really delicious! Thanks for sharing this recipe! For me, this soup is an absolute novelty. It looks so great, love eggs! Never had that before, but it sounds like it would be worth trying. Granted, the littles wouldn't touch it, but I'd probably enjoy. It looks so yummy!Thanks for the visit. Ohmygoodness this looks wonderful! I've never tried it before, but it has all the ingredients I love so I'm sure I'd adore it! The nutrients and benefits from this vegetable is new to me. Thanks for sharing it.